You can win Tournament Tickets in prize pools or via Dover Downs Hotel & Casino Online Poker promotions. Login to the Dover Downs Hotel & Casino Online Poker software and click ‘My Tournament Tickets’. 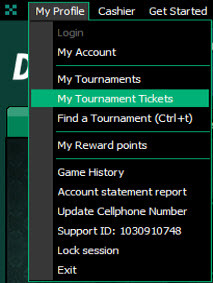 View your Tournament Tickets and choose an upcoming tournament from the drop-down menu that matches the ticket that you wish to use. (You can sort your Tournament Tickets by date, value, title and status). Click ‘Open Lobby’ and then register for the selected tournament.